Digital marketing is one of the most essential marketing strategies today. More than 40% of the world’s population are on the web now and digital marketing connects the business with the common mass in a much faster way. But the way digital marketing is taking shape these days, social communication gets a little rash at times! And because of this, the personal appeal gets almost lost. Generally, today, a company gets excited about digital marketing and immediately jumps into the process by carrying out a few tactics. For them, it’s only about marketing their products and services in front of the customers and in this way, they lose out on having that warm connect with their customers. Focussing solely on the online marketing tactics will make you miss your personal appeal. So, it’s vital to also have a human touch along with the digital measures being undertaken. Now, the question arises, how? 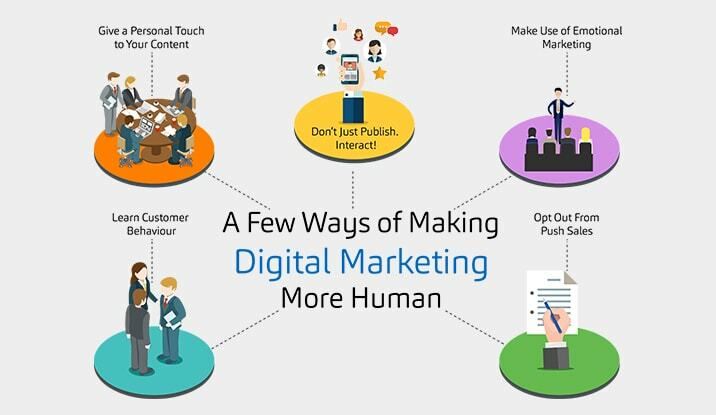 How can you make your digital marketing procedures more human, more personal? Firstly, you need to understand your customer demographics, like their age, gender, occupation, income, etc. Your services and products should be marketed to your target audience in a way which will pique their interests. You can create online surveys to know what they want. Also, you can have a one-to-one meeting with them. Yes, this is possible with sponsored gatherings and consumer events. Once you understand your customers, it will get easier for you to choose your website contents. However, you need to have real people by your side who will give a human and a more personal touch to your website contents. Also, the contents should be intimate, easily understandable, and down-to-earth. The tone should be something which your customers would prefer to read. This will make them feel at home when they visit your website. When you make social media postings, always remember that you must follow-up! You can interact with your customers through the comments and messages. More than 90% businesses use social media to reach out to more consumers. However, only a few of them remember to be in touch with the consumers through the same medium. Answer consumer queries on the posts, retweet, like, share and make your customers feel that you are human! Don’t just go for facts and figures while marketing your products and services. Most of the marketers are not aware of this but using emotion and passion while portraying your company in front of the customers will attract more people towards your business. Include story-telling, personal games, etc., to make the whole process fun. Today, technology can be the reason for aggressive marketing often and this can even put off your customers. So, stop trying to sell all the time. Instead, on your social media pages, share interesting information, blogs, pictures, etc. and make your audiences get engaged to your page with comments and likes. Technology has undoubtedly eclipsed all of us in such a way that human interaction is almost lost, although it has made things easier for the businesses worldwide. However, only hiding your business behind the strict digital façade isn’t good for your business growth. Nonetheless, these above-mentioned points can be of your great help for your business to remain human and not sounding like a mere robot. However, can you still think of any other ways which can make your marketing strategies more human? Do share with us!